Over the past few months I have noticed an increasing number of our site members are actually ex-Treo Users who have made the switch to BlackBerry. The article that follows details one man's experiences of making the switch from a Palm Treo 755p to a BlackBerry 8830 and his battles and observations along the way. The analysis is in-depth so we've split the article into two parts. Part II is be published at our sibling site TreoCentral.com. I'd like to welcome to the Blogs Matthew Streger...ding ding ding, let the match begin! From 1997 to last month, I carried a Palm OS device exclusively, virtually every day of my life. I upgraded almost every year to add additional features until I finally got an integrated organizer and cellular telephone, my personal Holy Grail. Unfortunately, over time, my needs have changed and I have finally come full-circle, back to the point where I no longer need extensive shareware, and instead primary application functionality and stability are paramount for me. Last year, I upgraded my Treo 700p on Sprint to a 755p. This was because my 700p was simply unusable. I had issues with the hardware lagging, the phone randomly crashing, often in the middle of critical telephone calls. I had issues with the Bluetooth dropping connections or refusing to reconnect. I couldn’t get Versamail to operate properly through my new job’s Exchange Active Sync, so I ended up registering ChatterEmail, a wonderful program that Palm purchased and immediately ceased supporting. After about seven months, every one of these symptoms had appeared on a brand new Treo 755p. So after eleven years, I decided to abandon the Palm platform completely and switch to a BlackBerry 8830. This article is my comparison of the two platforms after a little over a month of use. In the end, I think I made the right choice personally. I require my handheld to be absolutely reliable, and after a month of use, my BlackBerry has not crashed once. There are certainly things about my Treo that I miss, and things that the BlackBerry does (or does not do) that annoys me, or are more difficult than they would have been on my Treo. But for my needs, the BlackBerry is the superior device. 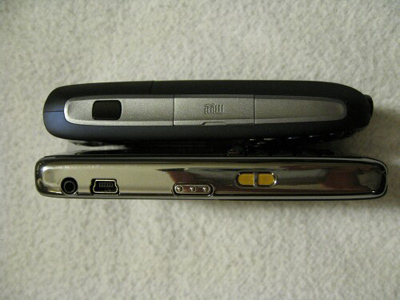 Form Factor – The Treo 755p is essentially the exact same size and weight as the first modern Treo, the Treo 600. That means that the primary device form has not changed from mid-2003 to today. Yes, some of the internals have changed, and the antenna is gone, but the basic device isn’t any different than it was almost 5 years ago. This bothers me – I cannot count the innovations that have come along since 2003 in handset technology, and how handsets have shrunk over that time. In comparison to the Treo, the BlackBerry 8830 is about the same height (and weight), and a few millimeters wider, but it’s about half the thickness. That’s a huge difference. It sticks out about half the distance when carrying it on your belt, or in your pocket. I truly would prefer a flip phone to protect the screen, and to conform to your face better, but nobody has made a Smartphone with a flip form since the Kyocera 7135, and I doubt anyone will again anytime soon. That being said, if you demand a full keyboard (and I do) then you are stuck with a wide device, and the difference between the Treo and the BlackBerry for width is minor, but the difference in thickness is huge. 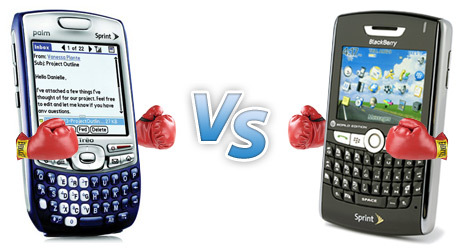 Screen – Once you get past the external form, the biggest hardware difference between these devices is the Treo’s touch screen. This is one of those things I thought I would really miss about my Treo. I think what made the original Palm successful was the natural, effortless navigation that comes with a touch screen. The truth is, I really don’t miss the touch screen that much. Sure, there are times I do miss it, and occasionally I still find myself tapping the screen with my fingernail. But there were disadvantages of the touch screen as well, such as when the Treo spontaneously turned itself on in my pocket (about once a day) and spontaneously started, say, dialing the phone. I hated the extra steps you have to go through with the keyguard on the Treo, so I kept it disabled. My decision, granted, but I also expect things like “on” and “off” to work properly. The BlackBerry’s trackball navigation is almost effortless once you get used to it. Now, coming from a Treo, it does take some getting used to, but it is not nearly as bad as you might think. It took me a few weeks to get it down, but to be honest, at this point I’m fine without my touch screen. I do think, however, that the BlackBerry’s screen is much nicer to look at. I have not compared the actual screen resolution, but to the eye, the BlackBerry is much brighter and sharper, and it has a sensor that automatically dims the screen when necessary (a feature notably absent from the Treo). I think the Treo’s screen lacks sharpness as a trade-off for having the touch screen. In the end, I consider this one a draw. Keyboard – While there are some minor differences, overall the keyboards on both devices are pretty similar. The layout of some of the secondary keys is a little different, but they are close enough that you can probably go seamlessly between them. Both keyboards are backlit as well, making low-light operation much easier. I give a slight edge in the keyboard department to the Treo – the keys are a little more responsive, and they have a separation that makes the keys easier to distinguish. I have big hands, and I would have thought that the wider BlackBerry might make my life easier, but the difference here is really negligible. 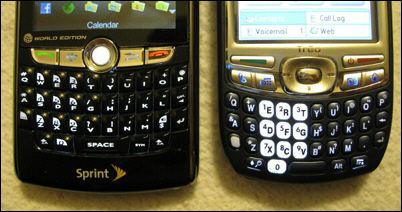 Both devices also have hard keys for starting and ending calls, as well as for volume and an extra “side button.” Of course, the Treo has the four main programmable keys for the main applications while the BlackBerry only has the “menu” and “escape” keys. Again, for the ability to program hard keys to bring you right to frequently-used applications, I give the edge here to the Treo as well. Battery Life – I cannot emphasize how much better the battery life is on the BlackBerry compared to the Treo. On my Treo, I would not make it through the day on a 2100 mAh aftermarket battery with normal usage. I attribute this in no small part to using ChatterEmail for push e-mail on the Treo. In fact, ChatterEmail used so much battery just in the background that I would not make it 24 hours on my Treo with usage at all. In comparison, heavy usage on my BlackBerry leaves me at about 50% battery at the end of the day on a 1600 mAh battery. Here’s another place where the BlackBerry, being newer technology, leaves the Treo in the proverbial dust. Other Features – The Treo uses a proprietary connector (or two, if you consider Hotsync and charging to be different). In fact, the Treo 600 has a different connector than the rest of the Treo series, none of which are compatible with any other devices. Instead, the BlackBerry uses a mini-USB connector for both charging and data exchange. I have countless extra mini-USB cables floating around, and it makes mobility much easier. Advantage, BlackBerry. On the other hand, the mini-SD card slot on the Treo is accessible via a side door, where the BlackBerry’s micro-SD card is underneath the battery door and difficult to access. There is a tiny metal clip that holds the SD card in place almost beneath the battery. Not the brightest design in my opinion, but certainly not a deal-breaker. The Treo also offers the IR port, which used to be a wonderful, if underused feature, for sharing personal information and small applications. Today, the IR feature is of limited usefulness as few devices have them, so I don’t consider this much of an advantage for the Treo. The BlackBerry does offer a new feature that countless other cell phones have, but for some reason the Treo has continued to omit it. The BlackBerry has integrated GPS, and I cannot tell you how useful I find this feature. Luckily, I have a Sprint handset, so the GPS is not disabled as it is on the Verizon handsets. This means I can use my BlackBerry as a poor-man’s navigation device if I don’t have my TomTom with me, but it also means that I can use the GPS to tell me what the closest, say, pizza place is to where I’m located. I love Google Maps for this feature, and for the new technology that allows the handset to place me within 1,700 meters if I can’t see GPS satellites. Of course, not only does the Treo not have a GPS, but it isn’t capable of using the cell towers in this manner because the Palm OS isn’t set up for that functionality. 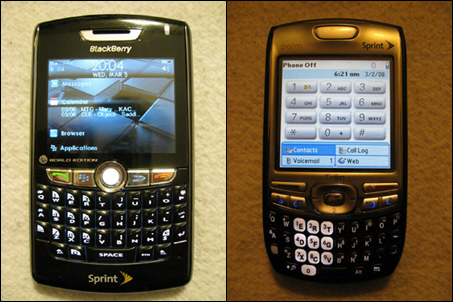 The BlackBerry 8830 has a GPS, where the BlackBerry Curve (more consumer-oriented) has a camera like the Treo does. I cannot compare the cameras of these two devices as I have never even held a Curve, but the camera of the Treo is functional at best. It’s about as good as the average camera phone, which is to say not very good. Oddly enough, the BlackBerry 8830 does not have MMS functionality because it lacks a camera, a decision I consider odd. I’d like to see this changed in the future, as people tend to get picture mail messages even if they don’t have a camera to send pictures or video with. I do love the case that the BlackBerry came with, and the fact that it has a little magnet inside that puts the device to “sleep” automatically when it goes into the case. That’s another trick the Treo could stand to learn. Palm devices used to come with a nice cradle to keep on your desk, but in a cost-savings measure they only have the charge-sync cable now (with the aforementioned proprietary connector). In the end, the mini-USB connector and GPS are much more useful than the minor annoyance of having the SD card under the battery, so I give the edge to the BlackBerry. Overall – In what will become a recurring theme, I think I give the BlackBerry the edge in hardware over the Treo for what is important to me. If you can’t live without the touch screen, or you pop your SD card in and out a dozen times a day, or you don’t do much wireless e-mail, then maybe you should stick with the Treo. Personally, the thinner form-factor, better battery life, and GPS give the edge to the BlackBerry. Stability – When comparing the Palm OS to the BlackBerry OS, the biggest difference is stability. There’s really just no contest here. I’ve always been a demanding Palm user, so I expected some crashes on my device – that’s what you get for loading on extra software. Over time, my tolerance for crashes has diminished, so I removed the majority of my aftermarket software. Unfortunately, the crashes continued to increase, and in the end, this was the major factor that pushed me away from the Treo. I experienced random crashes up to ten times per day, often at the most inopportune times. Like when I was starting a conference call with my boss. By comparison, I’ve had my BlackBerry for over a month now, and I do have a number of small aftermarket programs loaded. Despite this, it has not crashed once. Let me say that again – not once. I attribute this to the BlackBerry’s enterprise roots – corporate users simply will not tolerate crashing devices and it shows. The Treo’s open-source OS roots, once an enormous benefit, are now its biggest detriment. And in the end, this was my personal number-one consideration when deciding to abandon the Palm OS. Synchronization – The Palm OS definitely has a better synchronization system (other than BlackBerry Enterprise Server). First, it has a proprietary program you can synchronize to if you do not use Outlook. The BlackBerry is pretty much designed to synchronize to Outlook, period. I do know that there is a way to use Google Calendar with your BlackBerry, but it’s not out-of-the-box seamless, so it’s not good enough. That being said, if you do synchronize your BlackBerry with Outlook, it’s not much different than synchronizing your Treo with Outlook or Palm Desktop. The one-button HotSync is still a little easier than the BlackBerry system, which either requires you to always synchronize when you plug in the device, or you have to hit a series of software buttons to sync. Not horrible, but not quite as elegant as the Palm system. 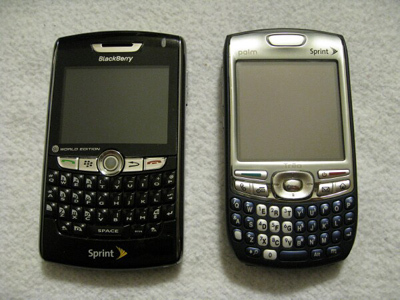 The BlackBerry does have a built-in backup program that’s more robust than the Treo. I give the edge to the Treo here, but only by a nose, and really only because of the Palm Desktop option. Third-Party Software – I will touch on some third-party software options in Part II of this article, but I wanted to note here the variety of software available on both platforms. A few years back, the Palm OS had a decided advantage here. There are literally thousands of programs available for the Palm that can do virtually every conceivable function. This has been the biggest draw of the Palm OS over the years, and as I noted above, remains an Achilles’ heel of sorts. While there is not as much of a variety of software for the BlackBerry, it seems to be catching up, and it is much more stable. Again, unless there is some killer application that you simply must have on either platform, I think this area is a draw. However, I do want to note one of the better features of the BlackBerry here, and one of the petty annoyances as well. Blackberries operate on “themes” of colors, backgrounds and icons that can be easily downloaded and installed. They can change the entire operating experience of your BlackBerry, and truly personalize the device for the user. That is, provided you don’t want to personalize it too much. For example, I use a theme that approximates the iPhone interface (I like the black background and simple icons) with a “today” home screen. I love being able to see my critical information at one glance. For me, critical information is today’s calendar entries and tasks and my messages. Unfortunately, it seems to be a BlackBerry OS limitation that tasks cannot be visible on a theme “today” screen. My home screen shows 2 unread messages, 2 calendar entries, and buttons for the browser and applications screen. Again, a nice feature with a little annoyance, but certainly not a deal-breaker. Customization – The Palm OS offers some customization options, such as colors and fonts, and this is put to good use with the information management programs discussed in Part II. The BlackBerry, though, offers many more options for customization. Besides the themes noted above, it offers almost limitless options for how to customize alerts. You can have different alerts for almost every function, from the calendar to each individual e-mail account, to instant messaging and more. In fact, the BlackBerry comes with numerous “profiles” already set up, such as normal, vibrate, phone-only, quiet, and loud. You can set up each of these custom alerts in each profile, and go further to set them up for “in holster” and “out-of-holster.” This operating system was designed to give the user as much flexibility as possible. 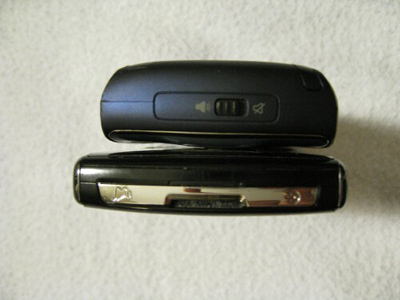 The Treo offers the “silent” switch on top, which is easier to use when quickly switching to vibrate. Unfortunately, this limits you to two options, on or off, and other software is required to provide the Treo with other alert profiles. On the hardware and operating system side, there really isn’t much of a contest – the BlackBerry is a much newer platform and wins going away. While there are a few design issues on the BlackBerry that are annoying, it seems a much better thought-out device. The Treo seems tired, with a traditional but clunky interface, few hardware benefits, and a marginal operating system. For me, the biggest difference here is the stability of the operating system, and that makes the BlackBerry a winner. In Part II of this article, I will review the primary functions of the Treo and BlackBerry, including information management, e-mail access, telephony and internet access. Read it Here. Matthew R. Streger, Esq., is an attorney/paramedic based in New Jersey specializing in health care litigation. You can leave questions/comments for him on this blog post, or reach him directly via email at medic1529@gmail.com.